The controversial accord signed by Prime Minister Yitzhak Rabin of Israel Yasir Arafat of the Palestine Liberation Organization (PLO) has the capacity both to exacerbate the conflict and to induce peace. It all depends, basically, on whether or not it signals a willingness by Middle Easterners to coexist with Israel. Let's consider three negative possibilities and three positive ones. 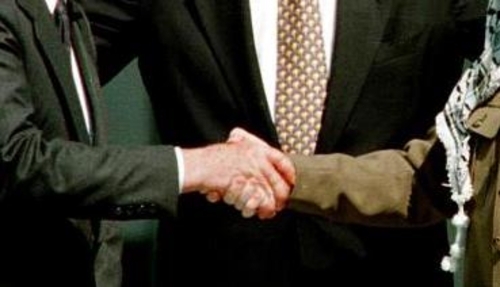 The Handshake (of Rabin and Arafat). Gives the bad old PLO a lease on life. On paper, at least, the PLO has capitulated. It accepts the permanent existence of Israel, renounces the goal of destroying Israel, forswears terrorism (yet again) as well as "armed struggle," and gives up the dream of returning refugees to their homes. Does this mean the PLO has in fact disavowed its heritage? Shimon Peres, Israel's Foreign Minister, has no doubts: "I think the PLO has changed its character. "1 But there's plenty of reason to wonder: it appears that Arafat adopted a flexible approach to fit adverse circumstances, saying whatever needed to be said to survive. The PLO had not a change of heart, just a change of policy. Along these lines, it's worth noting that Arafat harbors dreams of Israel falling apart from within. In March 1993 he observed that "the Soviet Union, for all its formidable power, collapsed. This could happen to Israel. "2 Assuming he really believes this, the deal with Israel represents a lease on life for the PLO so that it can stay in business until Israel falters, when it can deal it a death blow. Turns Gaza into another Lebanon. The real danger lies not in the powerful PLO state that Israel's Likud Party fears, but in anarchy. When the Israeli military administration abandons Gaza, will Arafat be able to take control of it? Or will the widespread animosity toward the PLO's secular, compromising approach lead to civil war? Should Gaza spin out of control, it could become a source of great danger to Israel and PLO-affiliated Palestinians. It could export terrorists to the West as Lebanon once did. More ominous yet, it might become a place of refuge for Egyptian fundamentalist Muslims trying to overthrow the Mubarak government. Nothing coming out of the tired leftist organizations headquartered in Damascus sounds like this. The accord may actually widen the appeal of the fundamentalist organizations. If they win the elections that the agreement says must be held by mid-1994, the Rabin-Arafat accord would be defunct. Puts Palestinians on the winning side. Palestinians have an astonishing record for picking the wrong allies. They aligned with the Central Powers in World War I, the Nazis in World War II, the U.S.S.R in the Cold War, and Saddam Hussein in the Kuwait War. Not coincidentally, they always picked the side which happened to be the aggressor and the enemy of the United States. Staying true to form, Palestinians would now side with today's the most aggressive and the most fervid anti-American power in the Middle East - the Islamic Republic of Iran. Arafat's deal with Rabin offers a way out of this old rut. Reduces Israel's role in Arab mythology. For decades, Arab leaders portrayed Zionism as a cosmic threat. Already in 1905, the Lebanese Christian Négib Azoury predicted that Arab nationalists and Zionists, "are destined to fight each other continually until one of them wins. The fate of the entire world will depend on the final result of this struggle between these two peoples representing two contrary principles. "4 More recently, Syria's Foreign Minister Faruq ash-Shar' made the astonishing declaration in 1991 that "Had there been no Israeli occupation [of the West Bank and Gaza] for the last twenty-four years . . . perhaps there would have been no Iraqi invasion of Kuwait. "5 If Palestinians are ready to make peace with Israel, Arab leaders will have to give Israel up as their universal alibi. No more will we hear King Fahd spouting nonsense about tiny Israel being "the root cause of instability and turmoil" in the Arab countries.6 And Middle Easterners might actually deal with real problems. Ends Israel's pariah status. Throughout its short history, the Jewish state has had a multitude of enemies - Muslims, Marxist-Leninists, anti-Semites, oil company executives, Arabists. Symbolic of this hostility, Israel suffered far more lop-sided votes at the United Nations than any other country. If Yasir Arafat, the international symbol of anti-Zionism, really does business with Jerusalem, Israel wins protection from most criticism. Those who obsessively wish to harm Israel find themselves pushed to the margins. Whole warehouses full of U.N. documents are rendered obsolete. Israel becomes a nearly ordinary country. In short, the Rabin-Arafat accord opens up many new possibilities. If they go badly, the accord could bring anarchy to Gaza and help fundamentalists overthrow the government in Egypt. If things go well, it reduces the emotional quality of the Arab-Israeli conflict and help bring further diplomatic agreements (most notably between Syria and Israel). Only time will tell whether it makes things worse or better in the Middle East. 1 Cable News Network, 9 September 1993. 2 Sawt al-Jabal (Shanayh), 6 March 1993. 3 An-Nafir, quoted on Sawt al-Mustazafin, 15 April 1990. 4 Négib Azoury, Le Réveil de la Nation Arabe dans l'Asie Turque (Paris, 1905), p. V. Quoted in Neville J. Mandel, The Arabs and Zionism Before World War I (Berkeley: University of California Press, 1976), p. 52. 5 "Newsnight," British Broadcasting Corporation Television, 6 February 1991. 6 The New York Times, 12? February 1985.